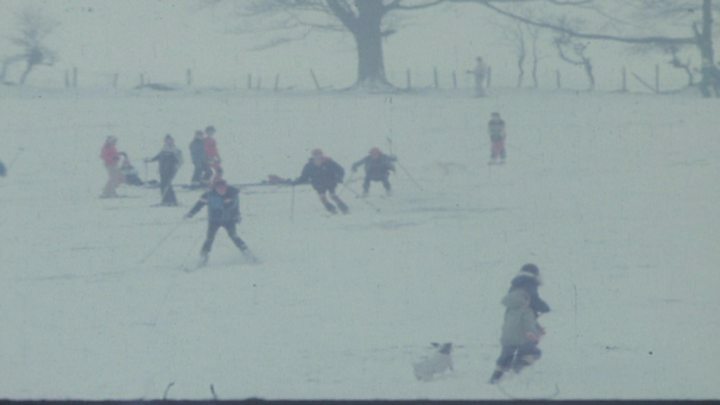 Thirty-six years ago, most of Wales was in the grip of one of the worst blizzards of the 20th Century. I was a teenager living in Barry, Vale of Glamorgan, at the time and I remember it well; being fascinated by the weather, it was an exciting time. It started snowing on the evening of 7 January and did not stop for more than 36 hours. Schools were closed for up to two weeks and many towns and villages in mid and south Wales were literally cut off. High pressure was located over Scandinavia and Iceland with bitterly cold easterly winds over the UK. Low pressure over the Atlantic moved towards the southwest and a front moved north into southern Britain bringing lots of snow. The snow was the powdery kind and accompanied by a gale force easterly wind forming huge drifts. Level snow lay 60cm (24in) deep in places with drifts about six metres (19ft) high. The M4 motorway was brought to a standstill and the roof of the Sophia Gardens pavilion in Cardiff collapsed under the sheer weight of snow. A train on the Cambrian coast line got stuck in the snow and passengers had to be airlifted to safety. Rescue helicopters from RAF Anglesey and Brawdy in Pembrokeshire worked non-stop, taking people to hospital and helping farmers, trying to stop their animals from freezing to death. The second week of January was exceptionally cold with record-breaking low temperatures. Glyn Foulkes remembers his dad's greenhouse thermometer reading - 27°C (- 17°F) in Llantysilio, Powys. He said: "On my way to work in Shrewsbury at the time I saw many truck drivers stranded. They had fires underneath their engines trying to get them to start. "And when I got to Shrewsbury the biggest shock of all, the River Severn was nothing but a mass of huge icebergs grinding against each other." Although parts of the UK including Wales have had some heavy snow this winter, I think it is fair to say we have had much worse to deal with in the past. The question is, will there be another blizzard like the one in January 1982 ever again? I would not rule it out. Maybe not this winter or next but surely it will happen again at some point in the future - we just need the right weather pattern!